After a steep increase from 2001 until 2010, treatment demand has remained about the same since 2011. Cannabis is the most common problem among young people. After alcohol, cannabis is the most frequently occurring problem in addiction care. Among most people requesting treatment, weed as type of cannabis is the primary problem (70%). 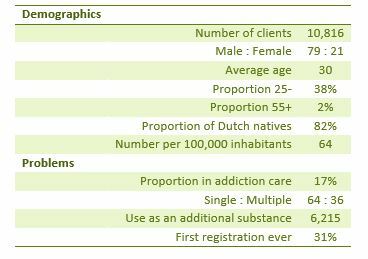 The average age of clients with cannabis use related problems is 30, which is relatively low. Multiple problems occur in approximately one-third of these cases.